The one thing I like about a vertical hive system is the options it gives you, but "options" means additional equipment which can present a storage space problem. If you're someone who appreciates buying something when it's on sale, with a coupon, using a card that gives cash back then you'll like this piece of equipment. In the summer, I use a 3/4" wood rim as an Imirie shim. In the Fall, I attach 1/2-inch hardware cloth to it and use it as a comb-crushing screen for strained honey. Today this piece of equipment is being converted into a Winter Candy Board. The candy will be placed above the super (under the quilt), to provide emergency food should the bees eat all their honey. My preference is to have the hive winterized (i.e. : stocked with emergency food and wrapped) by Halloween, but a candy board like this can be slipped into the hive very quickly any time during the Winter. No-Cook Candy Recipe: combine 3# sugar, 1/4 cup mineral salt (optional), 6 T. cold water, and 1/2 t. vinegar (optional). You may also add a few drops of anise essential oil to stimulate the bees' appetite. If the cluster has moved to the top of the hive, the sugar provides both insulation and moisture wicking directly above the cluster. These properties play as big a role in the bees' Winter survival as food stores. The 3/8" hole on the side of the rim provides a very small amount of ventilation and is (technically) big enough for the bees to use as an exit/entrance if necessary. It'll take only one dead bee to clog that size hole so if you're looking to provide your bees with an upper entrance, you might want to drill a couple-a-few (as they say in CO) holes for them. Three pounds of sugar can last as little as 3 weeks or as long as 3 months, depending on colony size and how cold it is. Be sure to watch traffic patterns, and plan to check under the hood in February. President's Day weekend is always a handy holiday for a quick inspection. Any one of these three hives is a good candidate for a candy board. You can make a candy "board" for a Top Bar Hive if you have empty brood combs available. Just fill the cells on one side of the comb with dry sugar and use a spray bottle of water to dampen. When dampened enough it will not fall out when you flip the comb and repeat on the other side. 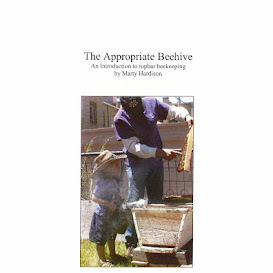 White wax may not be sturdy enough to handle the weight and manipulation, so that's why brood comb is recommended. Hang the comb just after the last honeycomb as emergency stores, or as close to the cluster as you can get if it is emergency feed. This is such an useful and informative post. Nice to find and go through it. Keep sharing such kind of helpful post. Thank you.